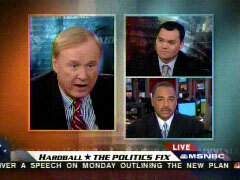 Chris Matthews is rooting for Barack Obama to get his so-called stimulus package passed so much he offered him advice on how to sell it, on Thursday night's Hardball, and cautioned him if he doesn't succeed in that sales job he'll "let us down." Matthews advised: "He has to explain how the stimulus package works. If he doesn't do it tonight, he's gotta do it Monday night on television -- that press conference. He's got to explain to us how spending almost a billion dollars is gonna turn the economic engine of this country on. And how it's gonna create millions of new jobs. He better show us, or he'll let us down." Former White House chief-of-staff Andrew Card's suggestion to Barack Obama that his administration should continue the Bush fashion code of wearing a jacket and tie in the Oval Office, out of respect, ignited Chris Matthews, on Thursday night's Hardball, to unleash an angry litany against Bush's foreign and domestic policies and then condemned: "If that's dressing for success I prefer shirt-sleeves." A ridiculing Matthews: "Well let's think of a couple of smart decisions that were made while the Bush administration was smartly dressed. You know, in full suit and tie. Let's see. Starting a war over a baseless argument. Bringing a government in surplus into adding more national debt than all the previous presidents put together. Oh yeah, letting an economic boom under Clinton become an economic catastrophe. If that's dressing for success I prefer shirt-sleeves." Appearing on Wednesday's O'Reilly Factor on FNC, CBS 60 Minutes correspondent Steve Kroft discussed his campaign interviews with Barack Obama that have been spliced together to create a CBS News DVD, Obama: All Access: "Well, they were dying to have somebody come out, especially 60 Minutes, very early on to kind of explain their campaign...we developed a nice rapport." Host Bill O'Reilly asked Kroft about the documentary: "...what does it say to people other than 'go, go Obama?'" Kroft replied: "It's an historical document. And I think we'll probably sell a lot of copies to libraries and things like that. Maybe to some -- maybe to some Republican political consultants." O'Reilly followed up: "Is there cheerleading in it?" Kroft responded: "No, I don't think so. It's -- we've taken the interviews and it is a straight narrative of the campaign." Two weeks ago, ABC's Good Morning America featured kids who offered up silly liberal platitudes for President Barack Obama ("I want you to make people stop littering because our Earth is dying"), but in retrospect they seem downright insightful compared to the collection of letters from children showcased in Wednesday's USA Today -- which embarrassed itself with a headline that characterized the writers as providing "helpful advice" to the new President. Reporter Greg Toppo, in the "Life" section article plugging a new book, 'Thanks and Have Fun Running the Country,' promised "it contains dozens of frank, heartfelt letters to Barack Obama, offering the new President congratulations, praise, reading lists and reams of helpful, bullet-pointed advice." Amongst the letters with that "helpful" advice listed next to Toppo's story, this from a 6-year-old: "I would fill the White House with chocolate and gravy (but not together) and mashed potatoes or maybe fill it with root beer. I'd drive through the White House on a boat. We'd make the floor out of mashed potatoes and the house would be filled with mashed potatoes....I'd have a couch made out of pudding that you could eat with a giant spoon. And I'd have a pizza carpet." Extreme environmentalist and Good Morning America weatherman Sam Champion on Thursday admiringly recounted the story of a Los Angeles resident, Dave Chameides, who has been living with his garbage for the last year. The liberal meteorologist also extolled the benefits of Chameides' unorthodox methods of disposing waste, including the worm composting program he has set up in the basement of his home. At the same time, Champion, who in 2007 highlighted a toilet paper-shunning environmentalist, attacked the "throwaway society of America." He complained: "We're the most wasteful [society] in the world." Chameides decided that for 365 days, no trash would be thrown away. In order to keep paper from piling up, he began worm composting. The Los Angeles man explained to Champion, who was taking a tour of his garbage-filled basement, "This is an in-home worm composting bin. All of my food scraps and paper and things like that go in here and the worms eat 'em up." Champion replied, "The worms are not for the squeamish," but enthused that they "do the trick." "Here's my belief. I think Presidents have to be clear, they have to make people understand exactly what they're doing. Like when the guy comes to fix something in your house. He has to tell you what he's doing or she's doing. It works that way. You want to know what they're doing down in the basement. You don't just want things to work. You want to know what they're doing in that car. When they give you the bill you want them to tell you what they fixed in the car. Function! He has to explain how the stimulus package works. If he doesn't do it tonight, he's gotta do it Monday night on television -- that press conference. He's got to explain to us how spending almost a billion dollars is gonna turn the economic engine of this country on. And how it's gonna create millions of new jobs. He better show us, or he'll let us down." "The office has earned respect, anyway. 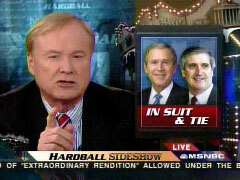 Well let's think of a couple of smart decisions that were made while the Bush administration was smartly dressed. You know, in full suit and tie. Let's see. Starting a war over a baseless argument. Bringing a government in surplus into adding more national debt than all the previous presidents put together. Oh yeah, letting an economic boom under Clinton become an economic catastrophe. If that's dressing for success I prefer shirt-sleeves." However, during the CBS News documentary aired on Sunday, December 28 and re-aired this past Sunday, Kroft pulled out the pom-poms: "...on the campus of George Mason University in the Virginia suburbs, where Obama held his first campaign rally, just two weeks after establishing an exploratory presidential committee...It was our first exposure to what came to be known as 'Obama-mania.' You sensed immediately that something unusual was going on, something rarely seen in American politics... 5,000 students had turned out to see him...he urged his young audience to cast aside its cynicism of politics and engage the system, evoking the words of Martin Luther King." Kroft continued to praise Obama's celebrity status throughout the broadcast: "He had yet to declare his candidacy, but he was already the biggest political celebrity in America. Propelled by the media hunger for a fresh face and a good story, he had graced the covers of 'Time' and 'Newsweek,' been endorsed by Oprah, and the campaign itself seemed to have morphed out of his latest book tour." When describing Obama's Democratic convention speech, Kroft declared: "Obama's acceptance speech attracted 84,000 people to Invesco Field in Denver, and another 40 million to their television sets all across America, more people than watched the opening ceremony of the Olympics." Kroft managed to forget that John McCain's speech at the Republican convention a week later surpassed the ratings Obama's speech recieved. UNIDENTIFIED CROWD: Obama! Obama! Obama! STEVE KROFT: He generated more excitement than any candidate in modern time. BARACK OBAMA: You guys are too fired up! KROFT: This is where you and Michelle first lived? OBAMA: That's right. We lived on the second floor. KROFT: But when we went to Illinois nearly two years ago to do our first story on Barack Obama, it wasn't because we thought he was going to be elected president. No one thought that. But he was becoming a political phenomenon. KROFT: Tonight, a unique behind-the-scenes look at Barack Obama's road to the White House. You think the country's ready for a black president? OBAMA: Let us transform this nation. KROFT: -to the conventionin Denver -- did you ever doubt it was going to happen? OBAMA: About a year ago, we were down 30 in Iowa. 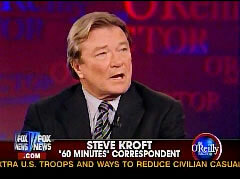 KROFT: Good evening, I'm Steve Kroft. Barack Obama's road to the White House on this special edition of CBS Reports. STEVE KROFT: When we went to Illinois two years ago to do a story on a young, charismatic senator named Barack Obama, it wasn't because we thought we'd see him sworn in as the 44th President of the United States. JOHN ROBERTS: So help you God. BARACK OBAMA: So help me God. KROFT: The historic scene at the capitol two weeks ago was something almost no one envisioned at the start of the campaign season, certainly not us. What we did see back then was that Barack Obama was becoming a political phenomenon, and there had never been a presidential candidate quite like him. His last name rhymed with 'Osama'; his middle name was Hussein. Racially, he was half-white and half-black, and politically, he was green. It would have been easy to dismiss him, if it were not for the fact that he was running second in the polls for the Democratic presidential nomination. We wanted to find out what all the fuss was about. BARACK OBAMA: This is the old state capitol. We've got, obviously, a lot of history here. KROFT: It was a frigid February night in 2007 at the old state capitol in Springfield, Illinois, where Barack Obama, a first-term senator with two years of national political experience, planned to announce his candidacy for president the following day. Three years ago, you were a state legislator here in Springfield. What makes you think that you're qualified to be President of the United States? OBAMA: You know, I think we're in a moment of history where probably the most important thing we need to do is to bring the country together. And one of the skills that I bring to bear is being able to pull together the different strands of American life and focus on a -- what we have in common. KROFT: You don't have any doubts that you're ready? KROFT: Where do you get all this confidence? OBAMA: ( Laughs ) My wife asks me that all the time. He sat at this desk. KROFT: As he gave us a tour of the building where Abraham Lincoln served in the legislature and delivered the 'House Divided' speech, there was much for Obama to be confident about. At age 45, he was one of only three black senators since reconstruction, the first African-American president of the Harvard Law Review, a professor of constitutional law at the University of Chicago, and the author of two best- selling books. This is a campaign banner? OBAMA: This is a campaign banner. KROFT: And he was just audacious enough to invite comparisons to one of the few American presidents who was elected with even less political experience than he had. OBAMA: And he grew into the presidency in ways that I think nobody would have anticipated. KROFT: We had first met him the week before, at the winter meeting of the Democratic National Committee in Washington. It was, in the parlance of politicos, a cattle call, an opportunity for all ten Democratic presidential hopefuls to make their pitch to the movers and shakers. OBAMA: I know that it's hard to believe that we can do this. KROFT: Obama's reception was warm -- which you might expect for a rising young star. But it was a tough room. Most of those in attendance were already committed to Senator Hillary Clinton or John Edwards, and Obama's candidacy was not yet taken seriously, at least by the party establishment. But it was a much different story later that afternoon, on the campus of George Mason University in the Virginia suburbs, where Obama held his first campaign rally, just two weeks after establishing an exploratory presidential committee. OBAMA: Our staff didn't had nothing to do with organizing this. They -- these kids organized it, we just showed up. How soon are we ready to start? KROFT: It was our first exposure to what came to be known as 'Obama-mania.' You sensed immediately that something unusual was going on, something rarely seen in American politics. OBAMA: You guys are too fired up! KROFT: 5,000 students had turned out to see him, flooding the main floor of the Johnson Center, and ringing the floors above. He had opposed the Iraq War from the very beginning, and he urged his young audience to cast aside its cynicism of politics and engage the system, evoking the words of Martin Luther King. OBAMA: The arc the moral universe is long, but it bends towards justice. It bends towards justice. But here's the thing, young people, it doesn't bend on its own! KROFT: He had yet to declare his candidacy, but he was already the biggest political celebrity in America. Propelled by the media hunger for a fresh face and a good story, he had graced the covers of 'Time' and 'Newsweek,' been endorsed by Oprah, and the campaign itself seemed to have morphed out of his latest book tour. STEVE KROFT: Well, we were with him at George Mason and it was like -- it was like a rock concert. I mean, he was -- people were mobbing him. Do you understand this charisma thing? You see it? STEVE KROFT: Obama's acceptance speech attracted 84,000 people to Invesco Field in Denver, and another 40 million to their television sets all across America, more people than watched the opening ceremony of the Olympics. ( Cheers and applause ) We were waiting backstage just moments after the most improbable nominee, joined by his vice presidential choice, Joe Biden, had given the biggest speech of his career. Did you ever doubt it was going to happen? JOE BIDEN: I knew it was going to happen before he did -- I was running like the devil. I watched. I thought I was pretty good, but I watched. I watched, this guy just sort of grabbed the lightning, you know, just grabbed it. And you could tell, Barack, I tell you, my team knew, I knew in August. KROFT: By the time we continued the conversation with them the next day in Pittsburgh, the political landscape had already changed. SARAH PALIN: Some of life's greatest opportunities come unexpectedly. KROFT: That morning, Senator McCain tried to steal the Democrat's thunder by announcing that Alaska Governor Sarah Palin would be his running mate. What do you think of Senator McCain's vice-presidential choice? OBAMA: She seems to have a compelling life story. Obviously, she's a fine mother and an up-and-coming public servant. My sense is that she subscribes to John McCain's agenda. KROFT: Does the fact that he chose as his vice president someone who has less experience than you take that weapon out of his arsenal? OBAMA: Well, you know, I think that's a good question to address to Senator McCain. Two weeks ago, ABC's Good Morning America featured kids who offered up silly liberal platitudes for President Barack Obama ("I want you to make people stop littering because our Earth is dying") , but in retrospect they seem downright insightful compared to the collection of letters from children showcased in Wednesday's USA Today -- which embarrassed itself with a headline that characterized the writers as providing "helpful advice" to the new President. Reporter Greg Toppo, in the "Life" section article plugging a new book, 'Thanks and Have Fun Running the Country,' promised "it contains dozens of frank, heartfelt letters to Barack Obama, offering the new President congratulations, praise, reading lists and reams of helpful, bullet-pointed advice." I would fill the White House with chocolate and gravy (but not together) and mashed potatoes or maybe fill it with root beer. I'd drive through the White House on a boat. We'd make the floor out of mashed potatoes and the house would be filled with mashed potatoes....I'd have a couch made out of pudding that you could eat with a giant spoon. And I'd have a pizza carpet. A 9-year-old urged help for the nation of Hawaii, "If I were President, I would help all nations, even Hawaii," while a 10-year-old reasoned: "If you could lower gas prices, it would be good so people could not waste their money. Or if they waste all their money, they should have more chances before they become homeless." 1. Stop the use of oil in cars. 2. Clean up the ocean. 3. Help animals that are endangered. 4. Help immigrants get better jobs. 5. Give money to schools. 6. Fire the governor of California. 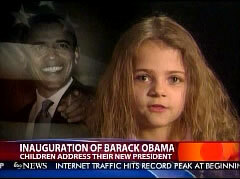 The headline over the online version of the article: "Kids shower Obama with 'Running the Country' advice"
Good Morning America on Wednesday featured video messages from young children to Barack Obama. GMA news anchor Chris Cuomo asserted that the kids, ranging in age from seven to 17, had "strong opinion[s]." Yet, every single one of these youths spouted the type of liberal propaganda usually reserved for people like Keith Olbermann and not one conservative voice was featured. One young boy sputtered: "Stop the wars. And because more people die. And it's just, they don't want to die. They just die. But they don't want to die." Another child, who couldn't have been older than seven, bizarrely informed: "All this time, I've been alive, I've been having white presidents. And I think now, it's, this is my chance to have a black president." One boy incorrectly wondered: "And how come people who earn millions of dollars pay less taxes than us middle-class people?" A regulation-minded girl pleaded: "I want you to make people stop littering because our Earth is dying." Of course, this pleased liberal weatherman Sam Champion, who sat next to Cuomo. After the segment, he approved: "You heard global warming and trees and recycling. That's great. That's great." Scratch beneath the surface of children's cheerful exteriors these days and you'll find what's really on their minds: poverty, homelessness, war and global warming, but also cats, dogs, hand sanitizer and cafeteria food. How do we know? They've unburdened themselves to the 44th president. A new book with perhaps the best title of 2009 '€"Thanks and Have Fun Running the Country ($12, McSweeney's Books) '€" arrives in stores this week. Conceived on election night and benefiting a national non-profit, it contains dozens of frank, heartfelt letters to Barack Obama, offering the new president congratulations, praise, reading lists and reams of helpful, bullet-pointed advice. It also offers a moving snapshot of children's lives in the waning days of 2008. Extreme environmentalist and Good Morning America weatherman Sam Champion on Thursday admiringly recounted the story of a Los Angeles resident, Dave Chameides, who has been living with his garbage for the last year. The liberal meteorologist also extolled the benefits of Chameides' unorthodox methods of disposing waste, including the worm composting program he has set up in the basement of his home. At the same time, Champion, who in 2007 highlighted a toilet paper-shunning environmentalist, attacked the "throwaway society of America." He complained: "We're the most wasteful [society] in the world." Chameides decided that for 365 days, no trash would be thrown away. In order to keep paper from piling up, he began worm composting. The Los Angeles man explained to Champion, who was taking a tour of his garbage-filled basement, "This is an in-home worm composting bin. All of my food scraps and paper and things like that go in here and the worms eat 'em up." Champion replied, "The worms are not for the squeamish," but enthused that they "do the trick." The ABC weatherman closed the segment by actually encouraging viewers to start worm composting themselves. Demonstrating how it could be done, he explained, "And you put your waste right in the top here. It can be just anything, like your egg waste, your banana peels, your newspaper waste. And these are the red worms that go on top of it." DIANE SAWYER: Well, think of Americans with all our waste. SAWYER: Toss in some other emblems of consumption, American style. Like all those cell phones in your life, TVs and computers and cars. SAWYER: And let's be honest with each other about the way Americans squander water. CHRIS CUOMO: He is the gift. That is how we call Sam Champion. And he has a gift for all of us this morning about garbage. As you know, he is on the trail of trash. He is going to take us to a man's home who has saved his garbage for 12 months in his basement. He wants to teach us what we can do, how little we can use. And, Sam, is taking us through. SAM CHAMPION: And now our series, "American Trash: Living With Garbage." Yesterday, we showed you how our out-of-sight trash and garbage can be found just sitting in the middle of the Pacific Ocean and never goes away. Today, one man set out to show us just how much trash we each produce in one year. Along the way, though, that experiment changed, as he became more aware of his garbage habits. America is a throwaway society. We're the most wasteful in the world. Nearly five pounds of trash a day for the average American. That's nearly 1,700 pounds a year. So, how do we become a less-than-average American polluter? DAVE CHAMEIDES: I am very efficient with my waste. CHAMPION: Meet Dave Chameides. A trash truck hasn't stopped by his L.A. home for exactly a year. CHAMEIDES: I made a decision that for one year, I would not throw anything away. And instead, I would keep everything in the basement. CHAMPION: The basement is ground zero for Dave's stash of trash. But, a whole year's garbage in the basement? I had to see it myself. [Taking a tour of Dave's trash filled basement.] I'll let you lead. Surprisingly, this is it. Dave's trash for the past 12 months. All tucked into just ten square feet of space. It's much less garbage than what the average person makes. And that's because, soon after he started the experiment, Dave realized it was actually easy to cut back on the trash. CHAMEIDES: The trails down the stairs are all the bottles. If I drank bottled water like most people do, which I won't, the whole basement would be full of it right now. CHAMPION: Each American, on average, will use over 15,000 plastic bottles in a lifetime. And about 80 percent of them end up in landfills, where it takes 1,000 years to decompose. So, what did end up in Dave's basement? 64 plastic bottles. 153 glass bottles. And just two aluminum cans. CHAMEIDES: This is the bag of bags. It's all the plastic bags from the year. You'll notice there are no plastic shopping bags in there because I basically will not use plastic shopping bags. CHAMPION: We all know the plastic bag is an eco-enemy. But we'll all use over 18,000 of them in our lifetimes. Tossed in a landfill, they'll linger for centuries, barely decomposing. Dave's plastic pile was for packaging only. His total, a mere four pounds. Cardboard boxes, 19 pounds of them. E-waste, 12 pounds. CHAMEIDES: This is a box of paper. It's, uh, 50 pounds-ish or something like that. CHAMPION: Far less than the 650 pounds of paper we average Americans use. And he got some help getting rid of it from a secret weapon. CHAMEIDES: This is an in-home worm composting bin. All of my food scraps and paper and things like that go in here and the worms eat 'em up. CHAMPION: The worms are not for the squeamish. But they do the trick, eating a couple of pounds of paper a month. Plus, all of Dave's food leftovers. [looking at the worm compost.] Yeah, I see some right there on top. After the one-year experiment, Dave racked up about 30 pounds of trash, not counting the recyclables, accumulating in one year, what the average American would produce in just a week. I think I'm catching on to this, Dave. And that is that you don't keep a lot of waste if you don't generate a lot of waste. CHAMEIDES: That's exactly it. And what I try to tell people, if they just think along the lines of consume less, conserve more, you've kind of hit it on the head. When you're going to buy something, look at it and think, where did this come from, what am I going to do with it and where is it going to go? CHAMPION: It was surprising to me, just how much, if you think about it before you buy it, how much less you'll throw away. Now, if you're into composting or think you want to get into it, this is something you can set up in your home. And you put your waste right in the top here. It can be just anything, like your egg waste, your banana peels, your newspaper waste. And these are the red worms that go on top of it. If you're interested in- this one is called the worm factory. We'll link you to it on our website, ABCNews.com. But, again, the biggest thing that we learned out of this whole thing was about to be a huge stack of trash was cut short, just by realizing, wait, I'm going to throw that away. So, why am I buying it like that? Tomorrow, we're going to look at where we've been storing our trash for years. How we've been playing on top of it. Living on it. And is it a good idea to go to landfills and can recycling help? Another edition of the MRC's new Notable Quotables e-mail, with the media's sappy inaugural coverage, will be distributed on Monday. Amongst the category headings reflecting the infatuation with Obama: "Dastardly Republicans Caused Daschle's Downfall," "Feeling Obama's Pain," "Changing Washington 'At Warp Speed'" and "Rush Limbaugh Criticizes Obama -- Does He 'Hate this Country?'" The new e-mail service is available in two formats: You can receive it as plain text, or in HTML which will feature graphics, images and click-and-play links to video clips. The newest edition will highlight five videos. Note: As a CyberAlert subscriber you will continue to receive Notable Quotables text every other week as a "CyberAlert Special." The new HTML version of the Notable Quotables e-mail, however, features an eye-pleasing colorful layout with photos, video images and the ability to click to play video clips. Suggest to any of your friends, relatives or work colleagues -- who might be overwhelmed by daily CyberAlerts but are interested in evidence of the media's left-wing agenda and wildest claims -- that they sign up for the Notable Quotables e-mail so they get a cache of fresh ammunition every other week.